The Shaolin Temple Secular Disciples Union resides actually in the second oldest Buddhist Temple in China, the Da Fa Wang Temple. It is older than Shaolin Si and unlike its more famous neighbour, Fighting Monks are still allowed to be trained there. (Fa Wan Shay) is also a Shaolin Kung Fu training centre with the best Shaolin monks within its ranks. 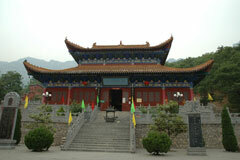 It is about 15 kilometers from the famous Shaolin Temple. The climate here is perfect for training - it does not seem to go over thirty and stays about twenty six most of the time. There is the occasional downpour which stops training but this only happens twice in August. It is beautiful, very green and lush - the temple is literally in the Jungle. WE PRACTICE 3 TIMES A DAY !!!!!!! The day starts at about 4 or 4:10 am.There is a monk who walks the temple top to bottom tapping the bamboo as a call to prayer for the religious monks. This happens at various periods throughout the day and in a quiet moment one can hear the same sound from the neighbouring Song Yue temple. Around 4:20 am a whistle blows - this is for the Shaolin training.The training begins running. Sometimes we do pressups and leg exercises. Then we practise forms, weapons or sanda. Finish by six am when the sun is up. Breakfast is at 6:30 or 7am. Breakfast is vegetarian while there is usually one meat dish for the other two meals. After breakfast, training is at 8:00am. Physical and stretching. At 9:40 or 10 am we practise again our forms. Lunch is around 11:30 am. Then there is a break until 15:30. Usually everyone sleeps at least one hour. Afternoon classes are like the morning - physical training followed by forms, weapons or sanda. After a break one can do Meditation, Qigong or Selftraining. Dinner is about 18:30. Bed time is 21:00. There are no belts in Kung Fu. We all wear the same orange robes. $ 450 EUROS FOR ONE OR TWO WEEKS. It is a traditional Chinese Wushu / Kung Fu School in China. It is one of the best schools for chinese students. You can learn traditional Kung Fu as well as modern Wu Shu for competiton, Sanda and Tai-chi. It is located in Zibo city in the province of Guangdong near a beautiful lake.